The Blessing of the Fleet and Seafood Festival~ White Boots Matter! We went to our first Blessing of the Fleet here in Mount Pleasant, SC, yesterday. 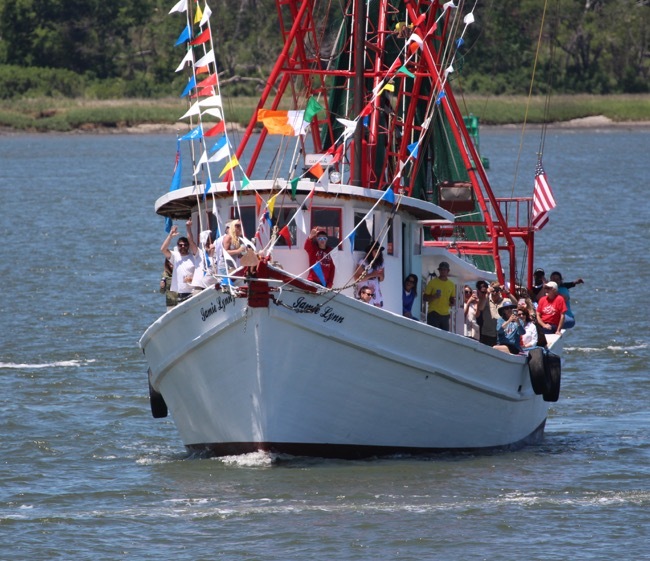 It was the 31st annual event supporting and honoring the local Mount Pleasant shrimpers and fishing industry. It all takes place under the Ravenel Bridge at the Memorial Waterfront Park. The event kicked off with the singing of the National Anthem, opening remarks by the town’s mayor, a bagpipe procession down the Waterfront pier, and a blessing of the fleet. 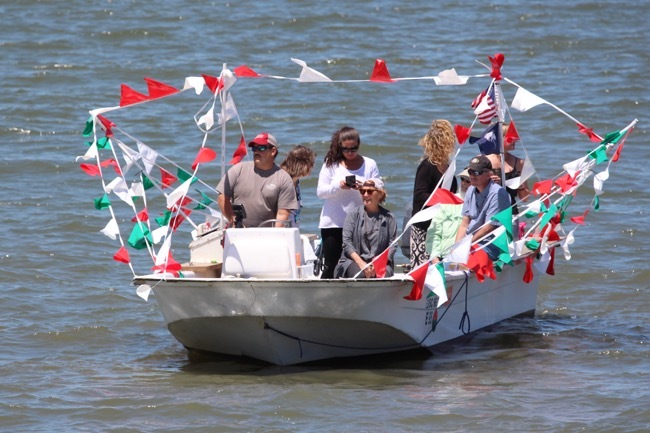 A parade of fishing and shrimp boats are announced one by one as they cruise by the waving crowd of people. Thousands come from all around to enjoy the event and support the local businesses. Before and afterwards, there are all different kinds of family friendly activities, live music, and an art exhibit by the Mount Pleasant Artists Guild. 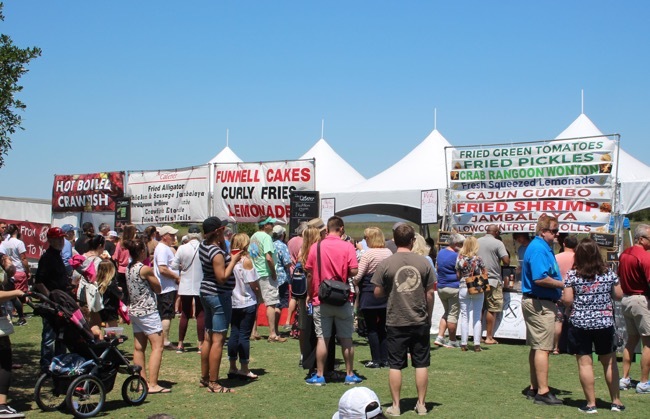 Food stations surround the park with all kinds of savory local seafood fare. This annual event kicks off the beginning of shrimp season. It is a tough business, competing with inexpensive imports. The shrimpers are carrying on what to many are family businesses and carrying on a tradition that they’ve known all their lives. 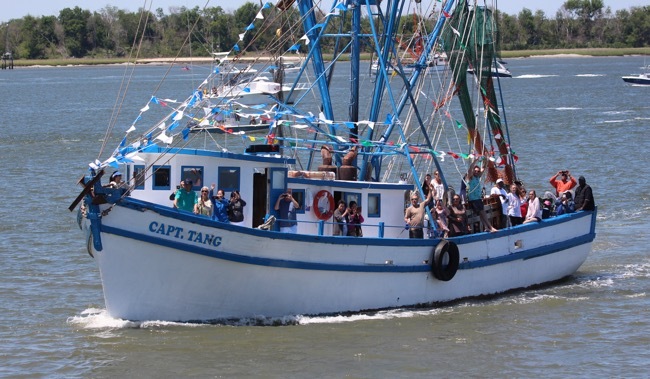 The number of shrimp boats in the area has sadly declined over the years and the remaining ones represent a once thriving industry in the Lowcountry. For the Maritime artist in me, the shrimp boats beautify the coastal landscape. Shem Creek is one of my favorite locations to go photograph because of the shrimp boats that call it home. I’m hoping to produce many paintings over the years of these local shrimp boats. It is sad to think of them disappearing because of hard times. Therefore, I am committing to eating more shrimp and grits, fried shrimp, shrimp gumbo, shrimp rolls, etc… Like Bubba Gump, I want to keep the shrimp industry alive. Someday soon you will be seeing Beebe paintings with shrimp boats in them. I’ve posted a number of my photographs of the colorful, local shrimp boats on my Facebook Page. Here are a few pics I took from our first Blessing of the Fleet! Thank you for reading my journal and for your interest in my art. Please check back soon to see what’s next on the easel.